Monitoring – WWT » GooseNews 14 is here! 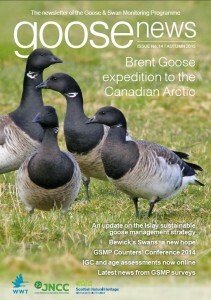 The latest edition of GooseNews is winging its way to participants of the Goose & Swan Monitoring Programme (GSMP). Following on from the dashing new-look of GooseNews in 2014, we’re excited to announce the arrival of the next edition. As usual, the newsletter is packed full with all the latest from the goose and swan conservation world, featuring updates on monitoring and research on the UK’s native geese and migratory swan populations. an interview with GSMP Local Organiser, Mike Bell. GooseNews can now be downloaded from the GSMP Reports and newsletter archive, and further details on the results of surveys carried out in 2014/15 can be found in the newly updated GSMP Species Accounts. We hope you find these interesting and that you enjoy reading them!